Every Nation in the world has a flag that they raise each day as a tradition to symbolize the values of the country and the dedication of its people to those values. Many Institutions and groups use flags to display their identity to the public. There are also flags for special occasions like festivals, etc. 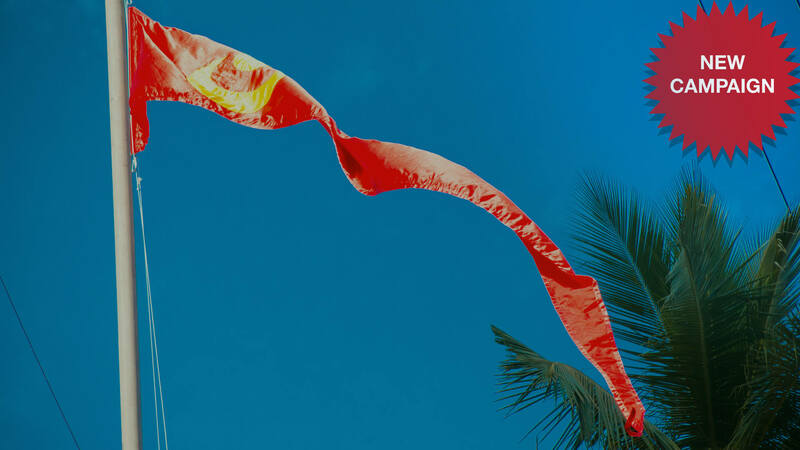 In Vedic culture flags are commonly used on temples, even to the present time such as in Jagannatha Puri where the temple flag is raised daily displaying the Sun and Moon dynasties. Even Arjuna used a Hanuman flag on his chariot during the battle of Kurukshetra. With the above in mind, the Temple of the Vedic Planetarium management have decided to officially roll out a daily Victory Flag raising tradition starting Kartik, 2018 (October 25th) that will continue unabated for hundreds of years into the future for generations of ISKCON devotees to observe for as long as the TOVP stands, and we are now historically at the very start of this important transcendental custom. Raising the TOVP Victory flag daily will symbolize the glory and victory of the spiritual headquarters of the entire universe, Sridhama Mayapur. It will symbolize the victory of Srila Prabhupada as Mahaprabhu’s representative who established the yuga dharma throughout the world and whose fame is spread all over the three worlds, as we sing daily at guru puja. It will symbolize the victory of the Sankirtana movement over the forces of Kali and the dense darkness of ignorance that covers the minds of a misguided civilization. It will symbolize the Hare Krishna explosion that is spreading throughout the world, inundating the fallen souls with Krishna prema. This will also begin the TOVP Daily Flag Sponsorship Seva wherein three new flags (raised daily by a devotee personally going to the top of each of the three domes) can be sponsored by devotees worldwide. We have prepared a daily flag raising calendar going up to the Grand Opening of the TOVP in 2022 and you can be a part of the historic beginning of this unique tradition. Along with the great satisfaction of sponsoring the TOVP Victory Flag, we will also ship it to you anywhere in the world as your personal memorabilia and reminder of your seva. Every day three new flags will be sponsored, raised and shipped to the donors. Devotees can sponsor a flag for the appearance day of an acharya or their guru, a relative’s birthday, a wedding anniversary, in memory of a deceased relative, or any other special occasion. Or simply for the seva of the Lord and to glorify the TOVP. Not only individual devotees, but ISKCON temples, zones, farms, preaching centers, restaurants, etc. can also participate. Each flag is red and will bear the standard logo of the Sun and Moon dynasty (see article photo). The sponsorship cost is $501 for either the Lord Nrsimhadeva or Planetarium dome flags and $701 for the Pancha Tattva/Radha Madhava/Guru Parampara dome and dates are now available going all the way to Gaur Purnima 2022. Certain calendar days like the appearance days of the Lord and the great acharyas will be more to sponsor, and Gaura Purnima 2022 will be a special sponsorship that will include multiple flags offerings throughout the day. The flags on that day will be offered at a special Homa yajna prior to being raised. All sponsorships must be paid in full at the time of making your date selection. Donations from this flag raising seva will help us to meet our construction deadline during the MISSION 22 Marathon for the next 3½ years. To sponsor a TOVP Victory Flag go to the link below to see the available calendar dates and select the date you would like, the name or occasion for which it is being sponsored and to make your payment. This sponsorship will require a full payment at the time of selection.